Africa has long been known as a continent for adventure travel, but many women also enjoy travelling to Africa for sun holidays and even shopping jaunts. Africa encompasses many different countries and cultures so it is hard to make generalisations about how to successfully navigate the entire continent, but some basic travel tips will help women stay safe and healthy as they travel around Africa. Women travelling to Africa should investigate necessary vaccinations and medications before they leave home. Similarly, women should research whether or not they will need visas for the countries they hope to visit and arrange for these before they travel. Once in Africa women should be sure to drink at least 6 glasses of water per day, more if they are in extremely hot areas or are engaged in physical activity, and strive to eat a healthy diet of fresh fruits, vegetables, whole grains and protein. However, if tap water is non potable then women should drink only from sealed bottles and eat only cooked food. Boiling water and storing it in sterilised containers may also be an option. Women should wear sunscreen at all times and retire to the shade if they feel dizzy, light headed or weak. Building rest breaks into the daily schedule and getting at least 8 hours of sleep per night is also advisable for women while they travel. Depending upon their own needs, women may also want to bring feminine hygiene products and condoms with them to Africa, and discuss their travel plans with their doctors if they are pregnant or breastfeeding. 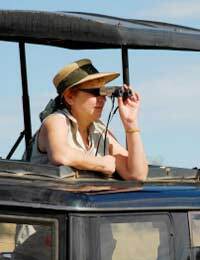 Many tourists believe that going on a safari is a must do when travelling in Africa, and women should not feel that they can not engage in these overland journeys to view big game and other wildlife. However, women should be aware that they will want to bring a sarong or other long, loose skirt to cover their legs when travelling to more remote areas. Women should also be aware that they may feel more comfortable travelling in a group or with a female guide, and that wandering off alone during the trip is never recommended. Women should keep their travel documents and some cash on them at all times, and should leave an itinerary of their safari with a friend or loved one at home. Women should also be sure to wear sunscreen at all times, drink plenty of bottled water each day, and follow all safety instructions as given to them by their safari guides. Many Western women may find that they attract unwanted attention when they travel in Africa. While much of this attention will be harmless, if a woman feels uncomfortable at any time or in any place she should not hesitate to leave. For the most part women can ignore any catcalls or shouts, but should avoid making eye contact with men. Women may also want to wear a wedding band, whether they are married or not, and carry a picture of a 'husband' with them while they travel. Women should dress conservatively in Africa and try to travel in groups if at all possible. Shopping for souvenirs in Africa will mean that women will likely travel to busy shops, markets, bazaars and souqs. If a woman feels uncomfortable in these areas, she should leave immediately. Women should also be aware that they may be expected to bargain in these environments, so staying polite and respectful though with a sense of humour should help the process along. In some areas of Africa, bartering for items with Western goods is another way to purchase souvenirs. Women should avoid buying items made from ivory, fur, coral or tortoiseshell as these items are illegal and often made at great cost to the local environments. Women who travel to Africa should be ready for the trip of a lifetime. Whether they visit Morocco or South Africa, Uganda or Botswana, women will remember their travels for the rest of their life. By looking after their health, staying safe on safari, coping with unwanted attention and shopping for the perfect souvenir, women will stay safe and healthy and enjoy Africa all the more.